Why work so hard cleaning for church services? Today, as I write this, we will wrap up the month of August! I am having a Tupperware party here today at 10:00 a.m., serving lunch to all who attend. I booked a party last year at daughter Susan’s Tupperware shower to help her get more points. The girls and I made two big pizza casseroles last night for lunch today. My sisters and daughter Elizabeth will bring in the desserts. I plan to make coleslaw yet to go with lunch. Son Joseph is clearing out some of the garden and the cabbage heads are ready to be harvested. Last night we had sweet corn again. Our second patch is ready to use now. Daughters Verena, Loretta and I attended the bridal Pampered Chef shower of our newly wed neighbor Rebecca. Supper was made for us by the Pampered Chef consultant. A huge batch of Eicher thick and chunky salsa. 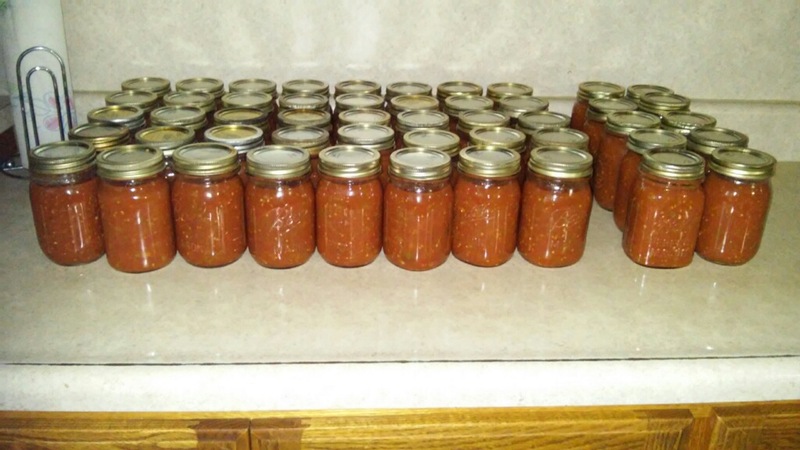 The girls and I made 52 pints of salsa yesterday so daughter Susan and Lovina finished cleaning up while some of us left for the shower. They also served supper to the men and boys here at home. Spaghetti and meatballs plus sweet corn were on the menu for them. Saturday, September 2, is our youngest son Kevin’s twelfth birthday. Has it actually been that long since our youngest child was born? Time has a way of slipping by us. Round one for hosting church services is done for us. We had a few families absent but company from other districts helped fill all the benches. We served eight tables of people for lunch. Each table seats 16-18 people. Toddlers and babies are fed ahead of time. Some women and girls that help serve also eat before so that makes less to serve at the table. We probably had around 150 people here for church services. September 10 will be a baptismal church service here for daughter Verena and another girl, Anita, who is also following instruction for baptism. I’m not sure how many to expect. There is another church district in the community that is also having baptismal services for five girls on the same day. We couldn’t change it to Saturday as Verena is tablewaiter at her friend Rosanna’s wedding. The wedding is over an hour away from here. I still need to sew Verena’s dress for the wedding and also her baptismal suit. Our church lunch this last time consisted of homemade wheat and white bread (forty loaves were brought in by the church ladies), ham, cheese, peanut butter spread, dill, and bread and butter pickles. Also had some freezer pickles; pickled red beets; hot peppers; tomatoes (from our garden); rhubarb, coconut, chocolate chip and sugar cookies; plus coffee and mint iced tea (sister Emma made tea concentrate so that made it easy for me). While dishes were being washed baggies filled with popcorn were passed out. I decided to not have anyone back for supper. It was nice to relax after a hard week. A reader recently asked why we do all the cleaning before church services. I know that church services could still be held if we didn’t clean, but since we like to give the house a thorough cleaning what better time to clean than when you have a deadline. My mother taught us to keep our house clean and it’s just something that stays with me. It was harder to keep order in the house when the children were younger. I hope this explains to any other readers that were wondering about the cleaning. We can serve God from any house no matter how clean. What matters most is that we have a “clean” soul. May God grant blessings to every one of you readers! And now I must not forget to mention that some of our children and I had the pleasure and joy of meeting sweet little Samuel Lee when he was five days old. He was born to niece Elizabeth and Samuel on August 24 weighing six pounds and some ounces. We enjoyed passing him back and forth. Such a sweet little angel. His bigger sister LaRose wasn’t too sure about us. She is 21 1/2 months old and loves her Grandma (my sister Liz). I must get busy now. Kevin is waiting on the bus to come. Here is a recipe to maybe save to use up leftover turkey after Thanksgiving Day! Cook vegetables separately in margarine. Heat milk and broth; add chicken base. Make a paste of the flour and a little milk, add to heated milk and broth. Cook one minute, or until slightly thickened. Add salt, pepper, cheese, cooked vegetables and cooked turkey to cheese sauce. Heat, but do not boil. Serves 12–16. Do you have a recipe for the pizza casserole? So enjoy reading your blog. 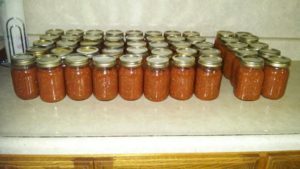 So many people have gotten away from freezing and canning. Sad because the fresh produce is so good, especially in winter when there are no gardens. Thank you for giving such inspiration. I would also like to know if your have a recipe for the pizza casserole?